Charles Darwin (1859) introduced the "Tree of Life" as a simile, which has since become very popular as a metaphor for phylogenetic relationships, especially among the general public. Darwin seems to have named his simile after its biblical namesake, and in doing so he "mobilized one of the oldest and richest traditions of imagery available to him. To play consciously on religious tree imagery was no new trick ... but still it helped Darwin to seize the imagination of his readers" (Hellström 2011). However, this simile was quite independent of Darwin's diagrams, because he always referred to his theory as "descent with modification" (see Penny 2011). Darwin referred to the Tree of Life at the end of the chapter containing his bush-like phylogenetic figure (see this image), and later he referred to relationships as being "somewhat like the branches of a tree", but neither of these was a direct reference to any diagram. Moreover, the original biblical tree was actually the lignum vitae (Tree of Eternal Life) not the arbor vitae (Tree of Life). It was explicitly contrasted with the lignum scientiae boni et mali (Tree of Knowledge of Good and Evil). Genesis tells us that Adam and Eve were exiled from the Garden of Eden after eating a fruit from the Tree of Knowledge of Good and Evil, to prevent them from also eating from the Tree of Eternal Life (as humans, they apparently were not allowed to have both eternal life and moral knowledge). This distinction between different trees is important historically, because prior to Darwin the biblical tree imagery had already been co-opted to refer to the arbor scientiae (Tree of Knowledge), rather than the lignum scientiae. That is, knowledge could be arranged like the branches of a tree; and indeed, that metaphor has come down to us today when referring to the different "branches" of human knowledge (e.g. branches of science). For example, Joachim of Fiore used the tree as a metaphor for historical relationships in his Liber Figurarum (1202) (Hestmark 2000); and in his book Arbor Scientiae (1295) Ramón Llull used it to illustrate the growth and inter-relationships of knowledge (Gontier 2011, Kutschera 2011). Augustin Augier (1801) is usually credited with producing the first such tree (Stevens 1994, Archibald 2009, Ragan 2009, Gontier 2011, Tassy 2011). It depicts the natural relationships of all of the plant groups known at the time, based on several parts of the flower. The taxonomic groups label the nodes, with genera labelling the leaves. As noted by Stevens (1994): "Families on different branches of the tree, but in a similar position, showed the 'relationship of analogy', while the 'relationship of proximity' occurred between different families on the same branch." The tree thus illustrates increasing structural perfection from bottom to top, on which Augier based his taxonomic classification. from Augier (1801). The analogy relationships are indicated by stars. It is perhaps worth noting here that this appears to be the first diagram of relationships published after those of Buffon (see this blog post) and Duchesne (see this post), and it is thus the first one depicting non-reticulating relationships as well as the first one not representing genealogical history. Indeed, Augier noted that although it is "like a genealogical tree" he accepted the pattern as coming from the Creator rather than genealogy. Augier states that he developed the tree idea after first trying to organize the families of plants according to a scale of perfection (a Scala Naturae, see this blog post), but failing. Some years later, Nicolas Charles Seringe (1815) produced a tree that represented, instead, the characters of a dichotomous identification key (Stevens 1994). This referred solely to the known Swiss species of Salix (willows). The branch labels indicate the two character states being compared at each step in the key, starting at the base, with the species labels finally appearing on the leaves. Identification keys are no longer drawn like this, but it is an interesting visual device. Identification key to the species of Swiss willows, from Seringe (1815). Carl Edward von Eichwald (1829) published a tree of animal life that is often assumed to be a depiction of the tree suggested by Pallas in 1776, as mentioned above (Ragan 2009). Only a zoologist could illustrate a leafless bunch of asparagus spears suspended in an aquatic wasteland, and treat it as a tree! The Roman numerals label the primary animal types. As noted by Ragan (2009), Eichwald considered that: "the first type arose from abundant 'globules of primitive mucus', followed by the others in temporal succession, each a branch off from, and elevated in relation to, the previous type". A tree of animal life, from Eichwald (1829), p. 41. 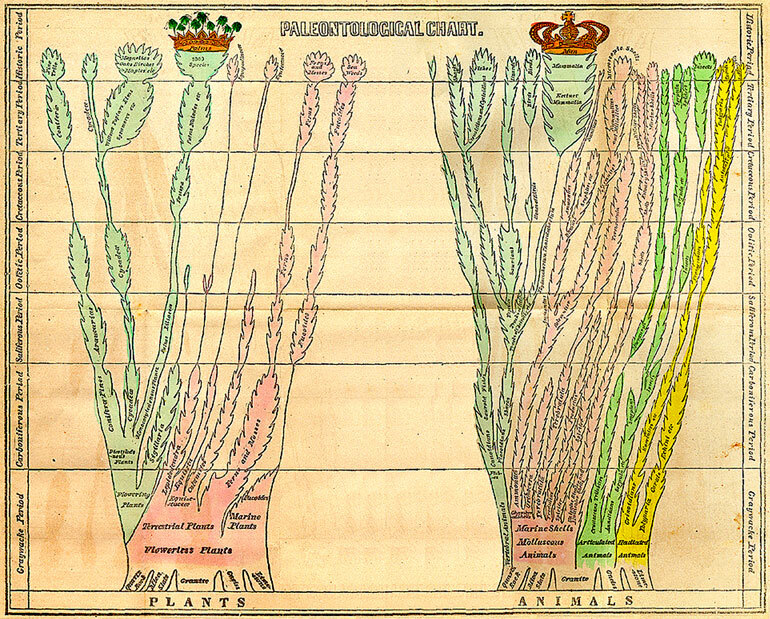 Edward Hitchcock (1840) produced a paleontological chart of the plant and animal kingdoms, which incorporated fossil time into the illustration of relationships (Archibald 2009, Ragan 2009, Gontier 2011), which had not been done before. Actually, not much is shown about relationships in the diagram, since few of the branches are connected other than at the base, but the extinction of fossil groups in different strata is clearly indicated, and the branch widths indicate the relative number of species at the different geological times. Interestingly, Hitchcock withdrew this diagram from the later editions of his book, immediately after Darwin published his similar bush-like figure in 1859, in opposition to its use to depict evolution, "arguing that evolution could not be the mechanism for change that he saw in the fossil record" (Archibald 2009). from the 8th (1852) edition of Hitchcock (1840). Heinrich Georg Bronn (1858) published another tree of animals based on the fossil record, albeit this time a theoretical one (Archibald 2009, Ragan 2009, Gontier 2011, Tassy 2011). The letters depict the various sequences of increasing organizational perfection of the animal groups through fossil time. As noted by Archibald (2009): "Bronn seems to have been most concerned with addressing the idea that although there was a trend toward perfection, less perfect forms kept branching even after more perfected forms had appeared". Later, Bronn was responsible for the first translation of Darwin's book into German (with his own commentary and a chapter of his own criticisms!). from Bronn (1858), p. 481. Finally, it is worth pointing out that the situation was somewhat different within the study of linguistics. The analysis of biological and linguistic relationships has much in common (Atkinson and Gray 2005), and similar techniques have been developed at similar times in both disciplines but quite independently of each other. In particular, phylogenetic trees have been developed both for the study of the historical development of languages and for biological relationships. However, one way in which the development of trees in linguistics differed from that in biology is that some explicitly genealogical tree diagrams appeared before 1859. Here are two examples (see Gontier 2011). Priestly (1975) notes that it was apparently František Ladislav Čelakovský who drew the first genealogical diagram in linguistics, depicting a history of the Slavic languages, which was published posthumously in 1853. This may thus count as the first phylogenetic tree in the modern sense of the word (i.e. it is interpreted exactly as would be a modern phylogenetic tree). A history of the Slavic languages, from Čelakovský (1853), p 3. However, it was August Schleicher who is usually credited with popularizing the use of phylogenetic trees in historical linguistics, starting with a short note in 1853 concerning the historical development of the Indo-Germanic language family. He published a more extensive account in 1861 (before he had read Bronn's translation of Darwin's book), and then in 1863 clearly linked his own work with Darwin's evolutionary ideas (Gontier 2011). from Schleicher (1853), p. 787. 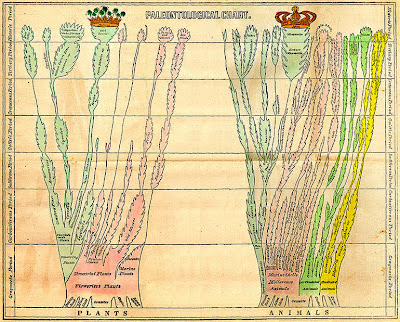 In biology, similar "relationships drawn as trees" representing genealogy were not published until 1866, by Ernst Haeckel (see this previous blog post). Archibald J.D. (2009) Edward Hitchcock’s pre-Darwinian (1840) "Tree of Life". Journal of the History of Biology 42: 561-592. Atkinson Q.D., Gray R.D. (2005) Curious parallels and curious connections: phylogenetic thinking in biology and historical linguistics. Systematic Biology 54: 513-526. Darwin C. (1859) On the Origin of Species by Means of Natural Selection. Murray, London. Gontier N. (2011) Depicting the Tree of Life: the philosophical and historical roots of evolutionary tree diagrams. Evolution, Education and Outreach 4: 515-538. Hestmark G. (2000) Temptations of the tree. Nature 408: 911. Priestly T.M.S. 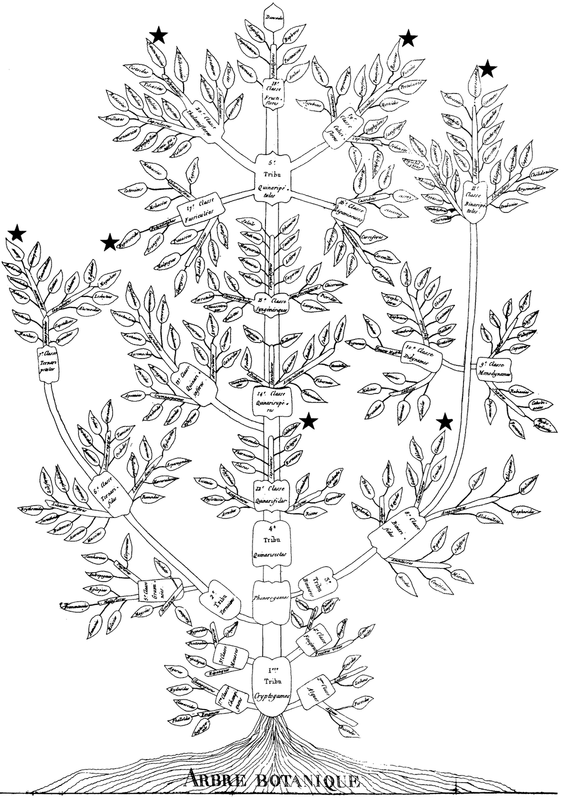 (1975) Schleicher, Čelakovský, and the family-tree diagram: a puzzle in the history of linguistics. Historiographica Linguistica 2: 299-333. Augier A. (1801) Essai d'une Nouvelle Classification des Végétaux. Bruyset Aîné, Lyon. Bronn H.G. (1858) Untersuchungen über die Entwickelungs-Gesetze der Organischen Welt. E. Schwiezerbart'sche, Stuttgart. Čelakovský F. (1853) Čtení o Srovnávací Mluvnici Slovanské na Universitě Pražskě. F. Řivnáče, Prague. Eichwald C.E. von (1829) Zoologia Specialis quam Expositis Animalibus. Josephus Zawadzki, Vilnae. Hitchcock E. (1840) Elementary Geology. Adams, Amherst. Schleicher A. (1853) Die ersten Spaltungen des Indogermanischen Urvolkes. Allgemeine Monatsschrift für Wissenschaft und Literatur 1853: 786-787. Seringe N.C. (1815) Essai d'une Monographie des Saules de la Suisse. Maurhofer and Dellenbach, Berne.